Felipe Pena (Gracie Barra) has won the Abu Dhabi World Pro three years in a row, but as he has been inactive so far in the 2017-18 UAEJJF season, he still needed to qualify for the 2018 tournament's main bracket on Thursday in Abu Dhabi. 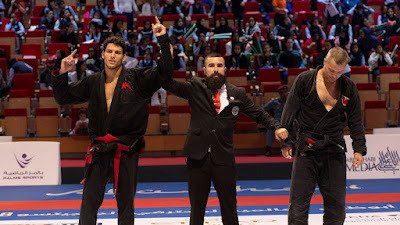 Pena looked flawless on his run through the 94kg qualifying rounds at Mubadala Arena, giving up zero points and submitting two out of three opponents. Now that Felipe has advanced to the main bracket, he will need four wins to reach the top of the podium in Abu Dhabi for a fourth straight year. The likely semifinal match will be against top-ranked Brazilian Helton Jose Junior (Cicero Costha).